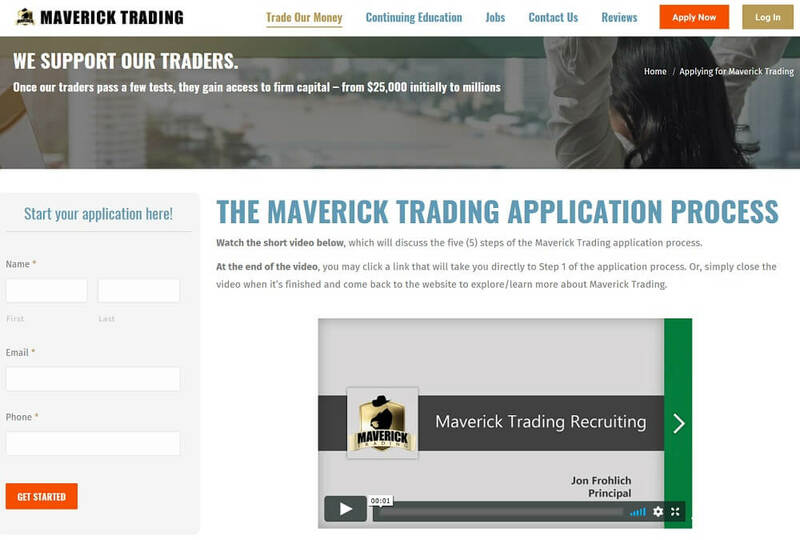 The Maverick Trading website has been redesigned in December 2018 and new free videos are available now. I took this opportunity to revise and update my Maverick Trading review. I'm pleased that Darren M. Fischer, CEO at Maverick Trading answered all my questions I came up with while crafting the review. I always see it as a positive sign when one of the reviewed companies answers even critical questions in detail. And that’s exactly what Darren did. He answered all my questions. Now I can provide you in-depth information about Maverick Trading that you won't find anywhere else! As you know, I have voted Trade Ideas the best stock screener, and Warrior Trading the best trading educator (paid trading course category). Does Maverick Trading now make the race in the field of funded trader programs? This Maverick Trading Review lives on detailed information and leaves no question unanswered. I’ll break down the whole program and let you know if it’s the right place to saddle-up. Who Is Maverick Trading Best For? Founded in 1997, the firm recruits new ​traders and teaches them how to become successful traders. Through its offering of proprietary trading strategies, software and rules-based tactics, the company’s system aims to help traders become consistently profitable. Its time-tested discipline and risk control strategies also allow prospective traders to achieve success right at the outset. As a remote trading provider, Maverick Trading employs full-time and part-time traders from all over the world. The service also welcomes traders of all experience levels. Both it’s capital sharing program and compensation structure allows the firm to align its interests with traders, creating a much more harmonized trading experience. Maverick Trading also offers risk management oversight, access to technology and provides access to its pipeline of professional traders through its funded trader programs. With access to capital ranging from $25,000 to $800,000 and up, the company not only teaches you how to trade, but finances you in the process. Maverick FX Funded Account program. Designed for traders of all skill levels, a Maverick Trading Stock/Options Funded Account allows you to officially join the firm and trade the market with Maverick’s own capital. Once you pass the initial tests, you can access capital ranging from $25,000 to $800,000 and up. What’s interesting about Maverick Trading is you have unlimited earnings potential. As your performance increases, the firm provides you with more and more capital. And through the teams Capital Sharing program, you can apply increased leverage to your positions without the downside risks associated with heavy debt. Now, the reason these levels are important is because they dictate how much capital you’re allocated and the percentage of profits you keep. The good thing about the compensation structure is it aligns the interests of both the firm and its traders. As your skill and performance increases, you keep more of the money you made. Once you demonstrate continued profits, low draw-downs and decreased volatility, the team will increase your trading limits, which again, is a win-win for both parties. What’s more, all profits are disbursed monthly. This is beneficial because it allows you to structure your employment as a business and take advantage of the favorable tax treatment. Another benefit of partnering with Maverick Trading is they don’t nick-and-dime their traders. Some other similar providers work with “mark up’s” on the commissions and recommend there traders to trade as frequently as possible. Because they make their cut on the commissions paid. 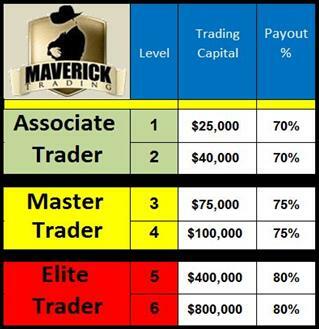 Maverick trading is different, they do not have mark up’s on their traders commissions. More about the Maverick Trading costs later in the cost section of the Maverick Trading review. At Maverick, They Profit When You Profit, so There Are No Conflicts of Interest. So they offer a plethora of trading benefits, but what can Maverick Trading provide in terms of education? According to Darren M. Fischer, CEO of Maverick Trading, traders typically invest several months in training. 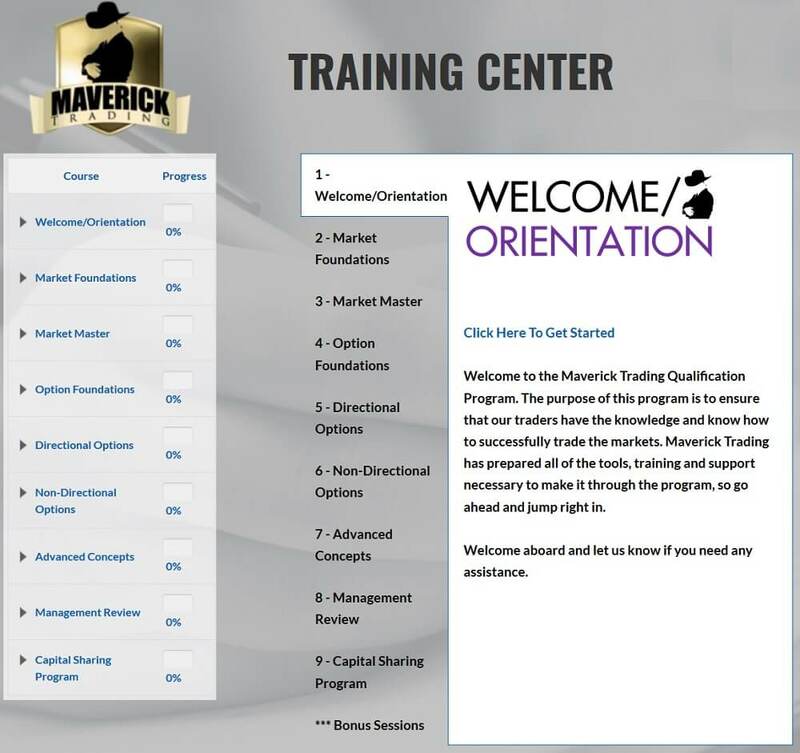 In the Stock/Options Division, Maverick Trading provides over 250 hours of structured, detailed instruction for their traders. Additionally, each trader enters a structured coaching program that assists them as they go through the material. Maverick Trading has well over 100 years trading experience at the firm (not counting the remote traders). This program is what they’ve distilled from their experience and represents what we feel is the minimum a trader needs to know in order to be profitable. Darren says that this is true for both our Stock/Options Division and the FX Division. There is a trade simulator component as well that hones chart reading skills in a rapid but no risk environment. Immediately prior to trading live capital, traders submit journaled trades in a demo account so that they can gain the experience of trading the markets with no risk. One of the first things a new trader does is take a personality test. Maverick Trading analyzes the results of that personality test with an eye toward trading, pointing out potential strengths and also possible weaknesses. The traders take these results and with Maverick Trading’s assistance build a personalized, detailed Trading Plan. The demo account trades are then analyzed with an eye toward how well the trader is following his own trading plan. Maverick Trading is then able to make recommendations to improve the trading plan in addition to risk management and general coaching. The coaches are all people who have been trading with Maverick for multiple years. Equally important is that their coaches are all salaried and incentivized to increase the profitability of Maverick Trading’s traders. So applying high-probability trading strategies, coupled with strict risk management – the team instills a trading muscle memory that’s built upon long-term goals and adhering to advanced statistics. As well, traders are immediately provided the best trading setups, software integration and position sizing methodology to quickly get you up to speed. Now what’s required of you? To demonstrate you understand its trading principles, each quiz – which needs to be passed in a series – verifies your knowledge of the various concepts. Once you complete the quizzes, you’re then required to create and submit a detailed trading plan. Here, you outline your interpretation of entry points, position sizing, position management, capital management and your monthly goals. This way, you have a detailed strategy you can stick to when times get rough. Darren points out, that: The trading plan should be followed at all times, whether times are rough or not. You will have contingencies in your trading plans. Additionally, Maverick Trading also practices basket trading. Depending on the trader and experience level, a typical basket of trades in a portfolio will be 8-12 on the low end and up to around 20 on the high end. This relates directly back to a trader’s capital allocation model and Maverick’s Top-Down Approach. You’re required to submit brokerage statements showing a minimum number of profitable trades spanning a consistent period of time. Practice account statements and simulated account statements can also be accepted under certain circumstances. So now the important question. What Does Maverick Trading Training Cost? You won’t find the pricing structure at mavericktrading.com. So I asked Darren, CEO of Maverick Trading to make the pricing structure transparent and he did immediately. I appreciate that! Darren, would you be so kind as to tell us more about the membership fee and risk capital allocation? Darren M. Fischer: The Membership Fee for the Stock/Options Division is $6,000. This is a one-time fee and provides lifetime membership. We routinely have traders take a break from trading (major life event, extended vacation, health issues, etc.). They are welcome to return and pick up where they left off whenever they like. Starting the second month of membership, there is a $199 per month Desk Fee. This covers the electronic infrastructure we need to run the firm, as well as continuing education, ongoing coaching, mentoring, supervision, support, etc. Once the trader is approved to trade the firm’s capital, the trader posts $5,000 in Risk Capital and we start them off with a $25,000 account. There is no lock-up to the Risk Capital and traders are paid out monthly. Level advancement requires two consecutive months above the previous high-water mark. Any losses beyond a trader’s Risk Capital deposit is non-recourse to the trader. Additionally, Maverick offers its traders a Performance Bonus. When the profit splits the trader generates that go to the firm equal $6,000, the firm issues the trader a check for $6,000 as a Performance Bonus to reimburse their Membership Fee. At this point, the trader has demonstrated that he’s able to trade consistently with increasing amounts of capital and we’re just happy to have him trade our capital at that point. Here you find some further reading about Prop-Trading: https://mavericktrading.com/what-is-proprietary-trading/. This white paper has some bearing on the requirements for Risk Capital in the industry as a whole. Is a Maverick Trading Funded Account Really Worth It? Well, it comes down to perspective. If you’re serious about trading options and have the skills to prove it, $6,000 plus the $199 monthly retainer are small outflows considering the amount of capital you’re allocated. And as we learned from Darren’s statements above, you can get back the $6,000 Maverick Trading membership fee as a Performance Bonus once you proved that you can trade. Let’s take a trader starting out at $25,000. Let’s say the trader is consistent, on the right side of the markets, and doing a series of defined-risk bull call spreads. This trader makes 2% in a month, on average. In a $25,000 account, that’s $500 gross profits. The firm takes its split of 30% ($150) leaving the trader with $350. Let’s say he does the same thing the next month and (for sake of the example) nets another $350. At this point, he’s got two months above his first high-water mark ($25,000, the account starting balance). He’s now eligible for a $40,000 at Level 2. While at Level 2, he trades in the same manner and grosses $800 per month, less the firm’s profit split ($240) and nets $560. Even with this example, a trader is still covering their monthly trading expenses and getting to trade far more capital than what they would on their own. Maverick trading works together with one of the best brokerage firms in the world – Interactive Brokers. Since they don’t markup commissions, their traders pay the same rates that Maverick Trading was able to negotiate. Currently, in the Stock/Options Division, it’s $0.005/share (half a penny) and around $0.50 per options contract per side ($1.00 round-trip), no ticket charges. Is the Initial Risk Capital Allocated in a Segregated Account? We have always segregated trading capital from operational capital and will continue to do so. We have been consistently profitable since our inception, so we are not worried at all about going out of business. But, in the highly unlikely event that a meteor were to strike the firm and our Business Continuity Plan was not able to be enacted, then all the firm’s positions would be liquidated and our traders’ Risk Capital balances (to include trading profits) would be returned to them. How Do Traders Get Paid? We pay out traders by direct deposit via ADP. Expiration Friday is the payday for our Stock/Options Division and the last day of the month is payday for the FX Division. On the Monday after Expiration Friday, the firm takes its profit split on closed positions. The traders can clip their entire profit, a portion, or do nothing and trade with more capital. They send us an e-mail and we distribute profits. It usually takes three days for the distribution to hit their accounts. We don’t charge a fee to send a trader his profits if we can use ADP. If they request a bank wire, then there would be a fee, but most traders prefer ADP. We just absorb that cost. We also keep a high-water mark on our traders accounts, so that if a trader does take a loss, they keep 100% of the profits until they’re back above their high-water mark. That’s it regarding the Maverick Trading stock/options division in the Maverick Trading review. Now let’s proceed with the Maverick FX funded account. Like its Equity/Options service, a Maverick FX Funded Account offers access to various amounts of capital and provides the same tiered levels of profit sharing. However, using its currency strategies, Maverick claims Elite Traders have the potential to earn over $100,000 per year. Darren confirmed that some traders do. On the plus side, every currency strategist on Maverick’s team is an active trader so side-by-side support and coaching is always available. Keep in mind though that currency positions are highly leveraged. Note by Darren M Fischer, CEO of Maverick Trading: Please remember that leverage for currency trading is limited to 50:1 in the US. Many firms outside the US offer 100:1, 200:1, or even 400:1. We teach that the key to success in trading is concentrating on risk management above all else. Considering it’s not your capital at stake it may not matter, but large equity swings can cause increased stress when trading. Darren: We train our traders in risk management both at the position and portfolio level in a similar manner as we do our Stock/Options Division. So What Does Maverick FX Trading Cost? As one of Maverick recruiting videos states, the capital requirements to trade in our FX Division are $3,000 Membership Fee (lifetime membership), starting the second month a $199 per month Desk Fee (covering the same services in the FX Division as in the Options Division). Once a trader is ready to go live, the Risk Capital deposit is $2,000. For the first two months, Maverick Trading will give a trader a $4,000 account to ensure they are managing risk properly. When they trade that successfully, they automatically give them a $10,000 account. From there, Level Advancement is similar to the Maverick Trading Options Division, requiring two months consistent trading above the previous high-water mark. Losses incurred in excess of the Risk Capital deposit are, again, non-recourse to the trader. The trader is eligible for the Performance Bonus as well once the profit splits to the firm equal $3,000. The top-level account in the FX Division is $300,000, which is still up to $15mil in FX positions. On the FX side, each trader goes through over 100 hours of detailed instruction and has structured coaching and supervision. I have to commit, that I have rated the absence of a direct free trial too bad in my first Maverick Trading review. Actually, Maverick Trading offers a free trial on request. The way Maverick Trading handles it’s free trial offering completely makes sense looking at Maverick Trading’s firm philosophy. If you aim for working only with the best traders out there and if you focus on having those traders in your companies for months, then your onboarding process has to be different compared to other financial products. For that reason, Maverick Trading provides temporary access to you if you are individually granted by their recruiters. I asked Darren to explain this in detail. Each trader who comes on board the firm is offered temporary access to the firm’s program so they can make the determination if this is the program for them. This temporary access is granted individually by our recruiters. This relates to your comment about no free trial for our Options Division as well. Trading is not for everyone. We have a lengthy and involved recruiting process to make sure that the people we bring on board the firm are serious about investing the time, energy, and resources into learning how to trade. I want their complete and undivided attention when they’re going through the Qualification Program because I also want their complete and undivided attention when they’re trading the firm’s capital. We want to control who gets temporary access to the firm’s Members Areas because we don’t want people trying to trade the way we do without the supervision we provide. If they’re only trading with partial understanding, they’re likely to get into trouble, especially if they don’t follow our risk management guidelines. There is also a wealth of information on the Maverick Trading Blog. Here, the team discusses various Maverick strategies and provides market-moving analysis to help you become a better trader. You can also follow the team on its Maverick Trading Facebook, Maverick Trading Twitter and Maverick Trading YouTube pages. Free trial: Yes. Temporary access granted by their recruiters. Maverick Trading’s focus is options- and Forex trading. You have to understand, that the risk of trading options an FX is higher compared to trading stocks. Because one single mistake trading stocks can ruin you (e.g. selling naked put’s without knowing what you do). In my opinion, Maverick Trading is best for those who are serious about trading options or Forex for a living, willing to learn over a long period of at least 12 months by following exactly the educational content Maverick Trading provides. I like to point out, that your commitment is crucial when joining a program like the one Maverick Trading provides. You have to ask yourself if trading options or Forex is the way to go for you. If you are interested in day trading stocks, then Maverick Trading is not the best way to go for you. Furthermore, you should have a solid capitalization right from the beginning since your upfront investment will be at least ~$11,000 for the options division and ~$5,000 for the FX division (membership fee + initial risk capital). As I lined out in the Maverick Trading review sections about the stock/options and FX-division, you can get back the whole one-time membership fee for both programs as a performance bonus. This is an interesting perspective. Being profitable with Maverick Trading limits your fees to $199 per month for the Maverick Trading program. A profit sharing rate of 80% is one of the best payout levels in this industry. If you have a winning strategy and the market data and experience to prove it, a funded account can offer a lot of benefits. Maverick Trading aims to help you to find winning strategies and over the time you will understand the markets better and better. By accessing larger amounts of capital like the one provided by Maverick Trading, you can increase your dollar-profits and do so with reduced personal risk in the process. Actually, some of our best traders are those that came in with no experience and learned to trade the right way, with consistent, stringent risk management, proper supervision and timely coaching. The reason they have done so well is that they didn’t have 20 years of bad habits that we had to break. Maverick Trading provides an interesting opportunity for traders to learn options- and Forex-trading and gain access to valuable capital at the same time. Other funded trading account programs like the one at TopStepTrader accept any investor as a new client. That often leads to the problem, that firms like that might have retention rates on a yearly basis that run at roughly 10% to 15%. Darren said that Maverick Trading’s retention rate on a yearly basis is over 90%. This is impressive! And how to they archive this? Maverick Trading has a different onboarding process. You have to go through an interview before you get temporary access to additional content. And before a new trader comes on board, the capital requirements to trade with the firm are thoroughly discussed during their interview with their recruiter. A further distinguishing feature from the competition are the assets traded at Maverick Trading. While other funded trading account providers like OneUp Trader focus on futures trading, Maverick Trading’s focus is options and Forex-trading. Furthermore the extent of Maverick Trading’s education, support and training is remarkable. It’ is not as comprehensible as Warrior Pro from Warrior Trading. But more than 200 hours of learning material are remarkable. Anyway, you cannot compare Warrior Trading with Maverick Trading, because Ross Camerons Warrior Trading focuses on day trading stocks, while Maverick Trading’s focus is swing trading options. The biggest hurdle when joining Maverick Trading is still the membership fee of $6,000 for the stock/options division and $3,000 for the FX-division. As Darren lined out, you can get back the whole amount as a performance bonus, but it is still an upfront-payment that goes out of your pocket at first. To get started, the company first interviews you. Then they educate and test you on your comprehension of Maverick Trading’s strategies and risk management practices. Next, you’re required to create a trading plan and submit it for approval. 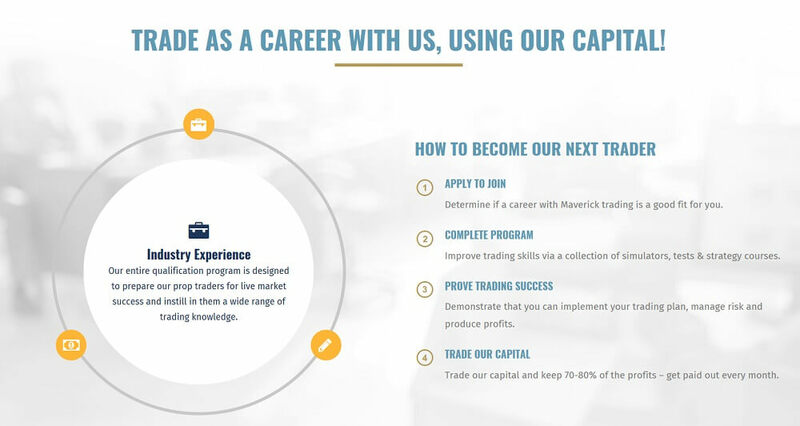 After you’ve been accepted, you have to transfer $5,000 risk capital and then Maverick Trading provides an initial $25,000 to $800,000 in trading capital in your funded trading account. Your trading capital power provided by Maverick Trading increases as your success-rate rises. ​Another thing that caught my attention is the fact that their YouTube channel was a bit outdated. But things changed and a few months ago. While Maverick Trading generally keeps their videos in-house for our members, they have recently begun posting more videos on YouTube. I hope that this Maverick Trading review was helpful. Please share it with your friends. Thank you! If you jumped right to this summary, I strongly encourage you to read the whole Maverick Trading review right from the beginning to the end. Only this way you become aware of all the details.